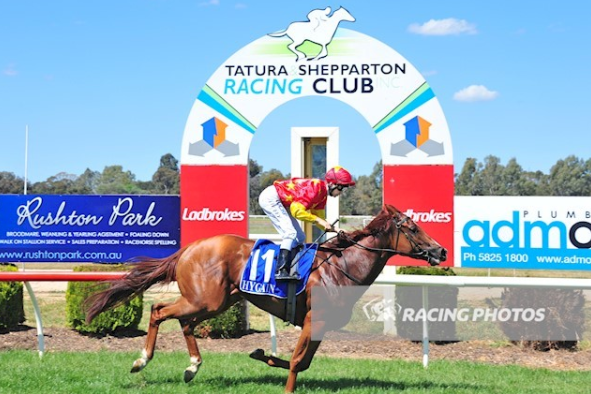 The most expensive filly from the first crop of Sepoy, Pirapala cast off maiden status at her first run for a new trainer at Tatura on Monday. Four year-old Pirapala started her career in Sydney with Gerald Ryan placing twice at Wyong and Warwick Farm last year. She had one unplaced run at Randwick in February and was subsequently transferred to the Hayes Dabernig training partnership. Sent out a short priced favourite, Pirapala powered to the line from back in the field to win the 1100 metre maiden by two and a half lengths. An $850,000 Magic Millions purchase for China Horse Club from the Mill Park draft, Pirapala is the first winner for stakes-winning Starcraft mare Celebrity Girl, a half-sister to the dam of Group III winner Generalife and daughter of stakes-winner Dashing Granada. Mill Park sold an I Am Invincible colt from Celebrity Girl at Magic Millions this year for $300,000 to Sun Bloodstock and she was covered last spring by Not a Single Doubt.